With Martha Bakes, discover Martha Stewart’s tips and techniques to create delectable baked goods. Be sure to check your local listings to see when the program will be airing in your area. Is there anything more indulgent than rich, creamy cheesecake? In this episode, Martha creates a feast of cheesecakes in a range of sizes and flavors, including an Italian ricotta cheesecake and individual cherry cheesecakes, and teaches viewers how to achieve perfect results every time. In this episode, Martha Stewart creates a feast of cheesecakes in a range of sizes and flavors, including an Italian ricotta cheesecake and individual cherry cheesecakes, and teaches viewers how to achieve perfect results every time. Martha Stewart talks about why it is important to hang your ricotta cheese before use. 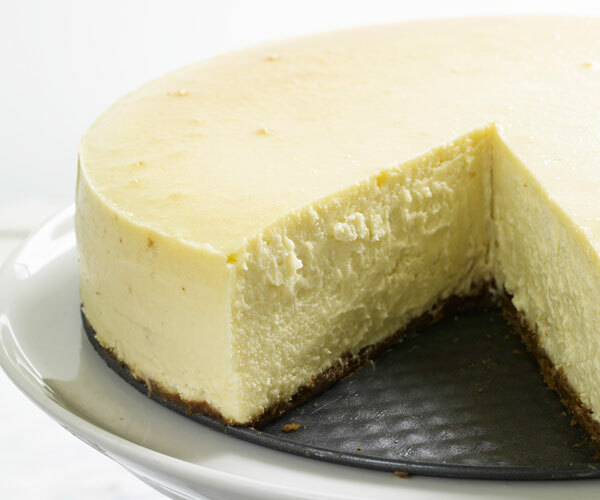 Once chilled, this New York-style cheesecake can be covered with plastic wrap and refrigerated for up to three days. In fact, it actually tastes best after being chilled overnight. Let it stand at room temperature for 20 minutes before serving. Adapted from "Martha Stewart's Baking Handbook." Preheat the oven to 350 degrees. Butter the sides of a 10-inch springform pan. Wrap exterior of pan (including base) in a double layer of foil. To make the crust, process graham crackers in food processor until fine. Combine graham cracker crumbs, butter, sugar, and salt in a medium bowl. Transfer mixture to the pan and pat into an even layer using the bottom of a measuring cup or meat pounder. Freeze the dough in the pan, about 15 minutes. Place pan on a baking sheet. Bake until the crust is firm to the touch and deeply golden brown, about 15 minutes. Transfer pan to a wire rack to cool completely. In the bowl of an electric mixer fitted with the paddle attachment, beat the cream cheese on medium speed until fluffy, about 3 minutes, scraping down sides as needed. In a large bowl, whisk together sugar and flour. With mixer on low speed, gradually add sugar mixture to cream cheese; mix until smooth. Add sour cream and vanilla; mix until smooth. Add eggs, one at a time, beating until just combined; do not over mix. Pour cream cheese filling into the prepared pan. Set pan inside a large, shallow roasting pan. Carefully ladle boiling water into roasting pan to reach halfway up sides of springform pan. Bake 45 minutes; reduce oven temperature to 325 degrees. Continue baking until cake is set but still slightly wobbly in the center, about 30 minutes more. Turn off oven; leave cake in oven with the door slightly ajar, about 1 hour. Transfer pan to a wire rack; let cake cool completely. Refrigerate, uncovered, at least 6 hours or overnight. Before unmolding, run a knife around the edge of the cake. Include a teaspoon of lemon zest to your batter to add another dimension of flavor. This recipe is featured in the "Cheesecake" episode of Martha Bakes.